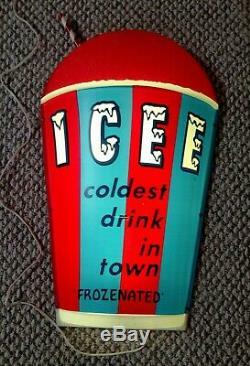 I think this is the coolest promotional light that ICEE ever made. It is certainly one of the hardest to find in good condition. 24"x15" light about 3 thick. Very good condition with minor wear. If you collect advertising, slushy, or ICEE goods, you will have to have this. This is one of my prized possessions. 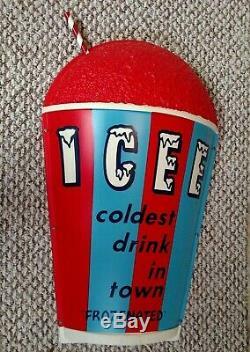 Check out my other ICEE collectible items. The item "Vintage ICEE Advertising Light Sign Slushie Slushy SUPER RARE LIGHT-UP SIGN" is in sale since Sunday, March 3, 2019. This item is in the category "Collectibles\Advertising\Food & Beverage\Dairy\Signs & Plaques". The seller is "mercantileman" and is located in Roscoe, Illinois.